Here’s a brief note on the conditions in Haiti and the effect of free food in Haiti sent to me by Connie. I wrote about Pat and Connie previously in my post, Who Needs SFG the Most? I also wrote about the effect of free food and entitlements in these two posts (1, 2). According to my friends, prices for medical attention and medicines has risen greatly in the country after so many experienced free just after the earthquake. Doctors and pharmaceutical suppliers have left the country, or raised their prices, so that they can sustain themselves in this free economy. The same is true for the free food sources, now more than ever, although some would say that was also true in the past in that the people are lazy when free is available. Although the Home Garden concept is still the best to reach the people, it has to have good possibilities including the source of water, the space, and the development of good soil. The people work for what they eat giving them pride and joy with the ability to grow some nutritious chemical-free food for themselves and their families. We are very busy in Maple Lake, mixing soil for about 40 families who came to us through Community Ed. classes in the area. Our home town is getting more aware of the system after all these years. Two more of our elderly folks will have raised box gardens this season and 3 more in the community have come to us for soil mix. Vermiculite cost has soared! $24 for 4cf at our local Menard store, which is our special price. They have it on the shelf for $26. This grade is a bit finer than coarse, and we like it. Earlier in the season they had the very coarse grade, 3cf for $12. Grids: Sharon used a heavy nylon string last year and thus we are promoting this with the people this year. Sharon put in building staples and strung the string through, Pat likes to put in screws and wind around them. What do you think? Glad to hear of all the activity in Maple Lake. We were just getting ready to post a picture of you with school gardens, so keep an eye out for it on my blog. How is your supply of books, including the original? Concerning the grids, I’m not happy with heavy nylon string or any kind of string. Part of the problem is that the staple or nail or screw put in will quickly rust, causing a hazard if you ever cut your fingers or wrists on them. That means a trip to the hospital for a tetanus shot. In addition, we find that anyone that tries string will have broken it in a few years – even if it is unbreakable. The box ends up without a grid, a real no-no for SFG. You also have the advantage of taking off the wood grid and working all the soil and one time, either in the Spring or fall. Another problem with using the heavy nylon string is that other people will look at it and say, “Oh, we can use string” and you know that it does get dirty, sags, and breaks so I would say that my vote is “Absolutely not” for all of those reasons. However, all that being said we’re trying something new in South Carolina at one of Victoria’s college gardens. They tried wood and it all got broken, stolen, or misplaced. They tried string and nails and the usual happened. As I walked onto the campus I saw all these beautiful boxes with no grids. For some reason or other, Victoria said that we had to have a solution and that we couldn’t insist on wood/vinyl grids for this particular campus. I suggested a compromise that I’ll offer to you and that is using heavy white plastic clothesline, run through screw-eyes put into the wood frame. They just knot on one end and you just go back and across down to the next screw eye and back again. She said they look great, they won’t break, they’re easy to clean and they’re thick enough to be visually noticeable and attractive. Thanks for your letter and I hope all is going well this spring. Please send pictures of the new Square Foot Gardeners who are elderly and need those boxes raised. You’re covering the gamut from very young to very old – that’s wonderful. I admire and appreciate all you’re doing. Also check out http://www.bochika.org to see the tire gardens in the poorest area of Port-au-Prince. 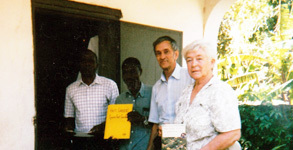 The use of tires stemed from Miradieu Estinvil in 1990 and now is used throughout Haiti. WOW!